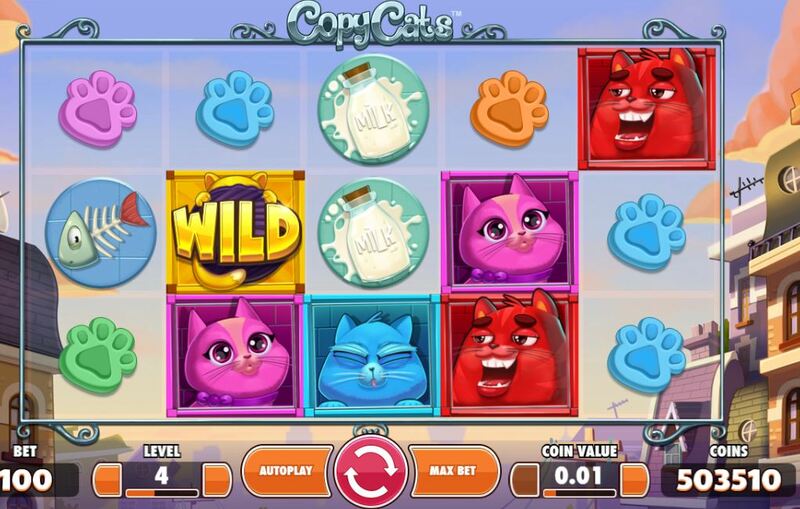 Copy Cats slot is game that does exactly what the name suggests - it's about cats and they tend to copy each other. The slot comes with a happy jazz soundtrack similar to what you get in the Pink Panther slot and a squeaky 'miaow' when a cat win occurs. The graphics are pretty basic and needless to say are very juvenile in quality as we have come to expect from many Scandinavian developers, but will you feel like the cat that's got the cream after playing Copy Cats? 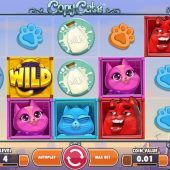 Copy Cats slot is played over a standard 5 reels of 3 rows each and has 25 pay lines with symbols stacked in pairs or singly with the exception of reel 1 which has full stacks. There are 4 different Cats - red paying 8x stake for 5-of-a-kind then pink and blue at 6 and 4x respectively. The Golden Cat is the Wild paying 16x bet and there are no card values but various coloured paw-prints all paying a single credit. In between we have a fish bone, clockwork mouse and milk. I mentioned that there are full stacks on reel 1 which is important as this is where the copying occurs - get a full stack of any Cat including the Wild Golden one and all Cats in view will transform to that same Cat. Although you don't get any particular Cat stacked fully on the reels apart from 1, you can get a full screen as some Cats double-stacked appear with a different one next to them. 400x bet is therefore possible, the typical maximum win on many Netent games including Neon Staxx and Secrets of Atlantis. There is one remaining icon to mention - the Cat's collar bell which appears on reels 1, 3 and 5. Get all 3 of these and you trigger a free games round consisting of 10 spins which can also be retriggered. The enhancement is that during these spins there exists only the Wild Golden Cat on reel 1 thus all Copy Cat events occurring will be made of Wilds.